The Ultimate Fighting Championship begins its ESPN era this week with UFC Fight Night: Cejudo vs. Dillashaw in Brooklyn, N.Y. 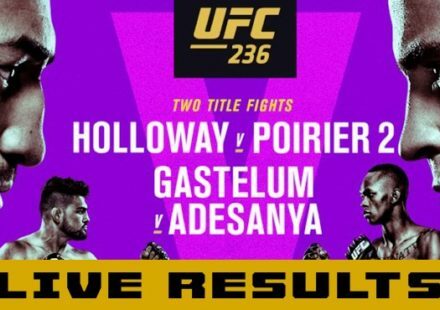 The fight promotion’s debut on ESPN and the network’s digital subscription service, ESPN+, kicks off with a champion vs. champion superfight between flyweight champion Henry Cejudo and bantamweight titleholder TJ Dillashaw for the 125-pound belt. The bout is made even more intriguing because of the doubt surrounding the UFC flyweight division’s future. Should Cejudo win, he might very well be saving the weight class’s future, while Dillashaw may be driving the final nail into the coffin of the division which appears to be on its last legs. The UFC on ESPN+ 1 main event was made official on Friday after Henry Cejudo and TJ Dillashaw stepped on the scale at the official weigh-in. Dillashaw stepped on the scales first weighing in at 124.6 pounds while Cejudo tipped the scales at 124.4.